Published: Feb. 4, 2013 at 01:13 a.m. 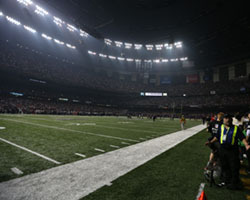 Updated: Feb. 4, 2013 at 02:09 a.m.
NEW ORLEANS -- The power outage that interrupted Super Bowl XLVII easily goes down as one of the more bizarre occurrences in NFL history. The 30-plus minute blackout in the Mercedes-Benz Superdome disrupted the flow of the game, but a handful of Baltimore Ravens players told me how they handled the distraction en route to a 34-31 win over the San Francisco 49ers. Things took an unexpected turn after halftime when stadium lights went out during Super Bowl XLVII. There was a slight delay in game action, but some memorable images were created while the bright lights were off. Take a look at some of the best images here. » Left guard Kelechi Osemele: "The whole time, I was just praying to be honest, man. I was just praying for the opportunity to get back out there. For us to try and get the momentum. Honestly, I was just praying to God that we would have the opportunity to get back out there for the opportunity to hold the ball and help our defense." » Return man Anthony Allen (on what was said during the power outage): "Finish. Finish. We were preaching that since we lost the AFC Championship last year. We came out here and did it." » Cornerback Asa Jackson: "No matter what happens, we gotta finish. That's been our big thing from the beginning of the year until the end, just now, is finishing what we started. We came out a little bit flatter than we may have wanted to, but at the end of the day, we finished strong and we're world champions, man. ... This team is so strong, we've been bonded together, man. It's like a brotherhood here. We knew that nothing anyone else could do could beat us, we were the only ones who could beat ourselves. And for a minute there we tried to, but we finished strong and now it's history." » Defensive end Arthur Jones (on what was going through his mind): "We gotta keep making plays. Keep our poise. Stay hungry. And do it for Ray Lewis. My main thing is tunnel vision. I envisioned that ring on my finger, and I would not be denied." » Right guard Marshal Yanda: "You stay focused. You know, coach (John) Harbaugh just said stay loose, stay hydrated. I took some stretches on the sideline. You can't really do anything about it." » Tight end Vernon Davis: "In a game like this, you have to put it all on the line. You have to be willing to die for your teammates when it came down to it. We just saw the opportunity and we thought about it during halftime. We knew what was on the line. We had to give it all we had because if we didn't, it wasn't going to happen. That's why I say I'm extremely proud of my teammates for what they did out there today." » Running back Frank Gore: "You have to wait. Football is a game of adjustments. The elements don't matter. I've been saying it all year, the elements don't matter in football. You've just got to learn how to make adjustments."